It’s not the magic recipe but at least this could be your starting point to the path of writing the perfect book that will smash among reader communities worldwide. 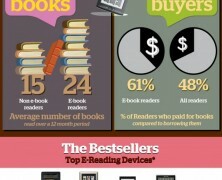 On this sheet you will see some facts over the increasing popularity of e-reading. Is just a trend or a practical alternative for the modern lifestyle?